My sales have already outpaced any Barnes and Noble sales I've had. (Though I'm wondering how much reach Kobo would give me for the international market). What promotion have I done so far? From looking at my analytics, reddit gave me about 300 hits, twitter another 100 and google about 50. This resulted in 14 sales and 6 lends. Not bad. 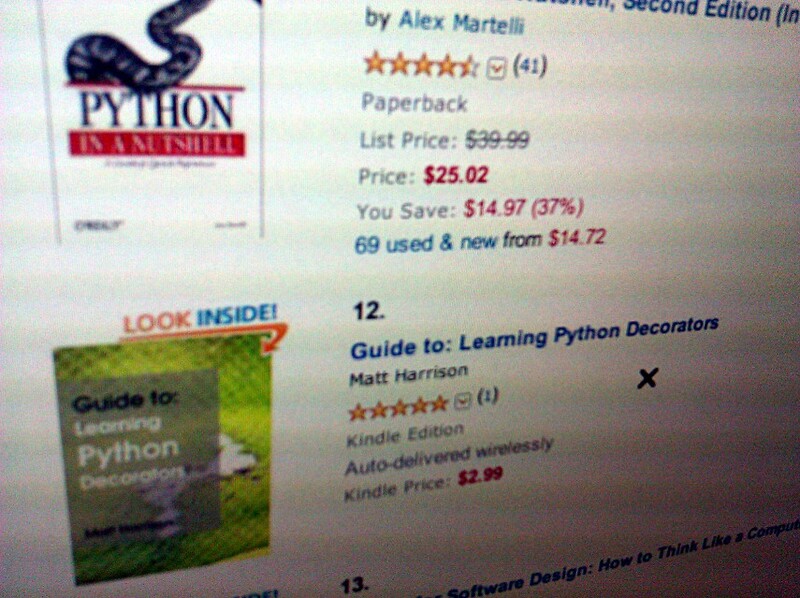 Also looking through the list of non-fiction Python books, most are $30+. My decorator book is pretty short (a couple of chapters and priced at $2.99), but my Treading on Python book is about 140 pages. The way Amazon pricing structure works, I'm penalized if I price between $10 to $20 (above $9.99 and you are in the 30% royalty system rather than 70%). Perhaps this makes the shorter guide type books more reasonable and a "no-brainer" purchase. But I'm wondering if the lower price hurts with my longer non-fiction book? Do people equate price with quality or density of useful information?